Overwatch’s latest hero launched earlier this year with Brigitte taking to the field. Sure, there may be some concern that she’s too OP, but we’re still waiting for the dust to settle on the meta – in the meantime, we need to talk about the important stuff. We’ve gotta discuss lore. In particular, we need to discuss cat lore. Stay current with the Hanzo rework and Tracer nerfs in the Overwatch v1.23 patch notes. We know Brigitte is a cat person. Blizzard say “she probably looks at a lot of cat holo-gifs,” and a white cat figures prominently into her backstory videos. That cat may or may not be the infamous Jetpack Cat, but we do know Brigitte fastidiously prepared a suit of armour for them. We asked the Overwatch team for further details on Brigitte’s pets, because we’re all about hard hitting journalism. 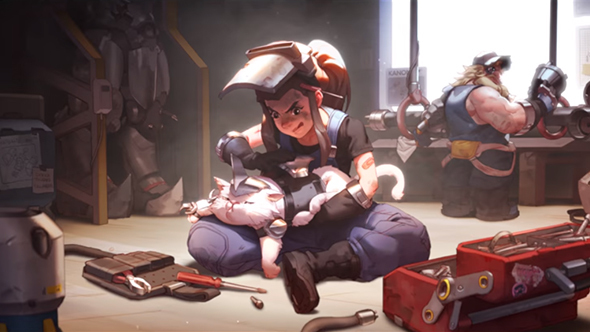 So the little white fluff – who again, may or may not be Jetpack Cat – is named Mitzi, and there are more felines in Brigitte’s cat army. Perhaps we can look forward to swarms of Jetpack Cats, clouding the skies with rocket emissions and tiny meows.